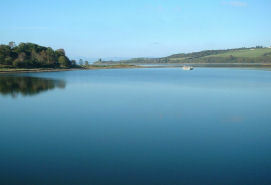 Inch Lake is a Man made freshwater lake formed when dykes and embankments were constructed to drain the flat marshland between Inch Island and Bridgend. Blanket Nook is another area of freshwater formed in the same way to the southwest of Inch near the village of Newtocunningham. These two lakes and the surrounding land support a large population of water birds. 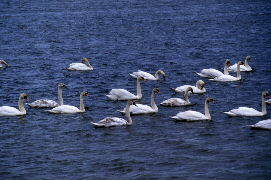 The most visible of these are swans. 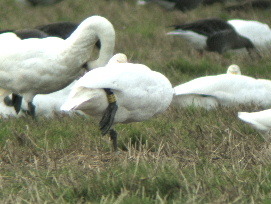 Mute ,Whooper and Bewick's can be seen. The Mute Swan is the common swan that can be found in city parks but the other two species are winter visitors from Iceland (Whooper) and Siberia (Bewick's) but for some years past a few Whoopers have been staying in our area through out the summer. Six species of wild geese are present in winter and they are ,White Front, Greylag ,Barnacle, Brent ,Pink Footed, which breed in the arctic, mainly Greenland and Iceland and Canada Geese which are not visitors from Canada but naturalised birds originally escapees from parkland. Great Crested Grebes are usually easily seen from the lakeside road into Inch, as for Little Grebe ,Tufted Duck and Coot. On the top of the bank on the other side of the road many different waders can be seen feeding on the mudflats at low tide. 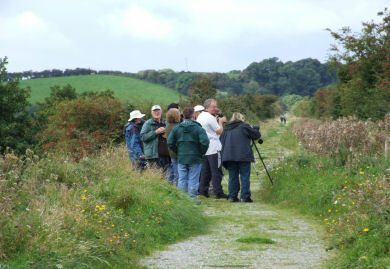 Among them are Curlew, Bar-tailed Godwit and Redshank. 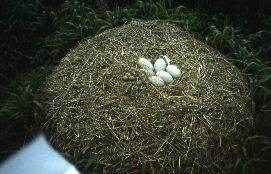 There are two places near the lake where Herons nest in trees in groups (known as rookeries). There is a small islet in the lake where is a colony of nesting Common Tern, Arctic Tern and Sandwich Tern which depart for the coastof Africa in the Autumn. Some of the smaller birds present around the lake are Sedge Warbler, Grasshopper Warbler and Reed Bunting.The Kingfisher is sometimes seen at the lock gates at Blanket Nook and at the small streams that run into Inch Lake. as part of the Heritage Week activities.